An eco-friendlylactobacillus sp. (microbe) assisted synthesis of titanium nanoparticles is reported. The synthesis is performed at room temperature. 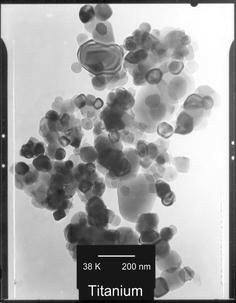 X-ray and transmission electron microscopy analyses are performed to ascertain the formation of Ti nanoparticles. Individual nanoparticles as well as a number of aggregates almost spherical in shape having a size of 40–60 nm are found. In recent years, materials with nano-sized dimension have attracted considerable attention of the researchers throughout the globe. In modern nano science and technology, the interaction between inorganic nanoparticles and biological structures are one of the most exciting areas of research. Also, taking into consideration the environmental, health and social aspects, there is a need to develop an eco-friendly approach for nanomaterials synthesis that should not use toxic chemicals in the synthesis protocol. This is now well known that many organisms, can produce inorganic materials either intra- or extracellularly . Bacteria, being prokaryotes have survived the test of time in enriching ions , synthesizing magnetite nanoparticles [1–3], reducing Ag into metal particles, forming nanoparticles [4, 5] and in generation of cermets . The recent discovery of the bio-synthesis [6, 7] of metal nanoparticles point towards new biotechnological methods in materials science. Nanocrystals of gold, silver and their alloys have been synthesized by the assistance of lactic acid bacterial cells . Mukherjee et al. have successfully synthesized of gold nano-clusters using fungus. Recently, the synthesis of nanoparticles of gold , bimetallic , zinc  and even lanthanide clusters  have successfully been demonstrated using the tannins of the biomass of Medicago sativa (alfalfa). Recently seed mediated method for the synthesis of silver nanoparticles in which tannin was used to reduce silver salt in aqueous solution has been reported . Titanium, by weight, is one of the strongest readily available metal, making it ideal for wide range of practical applications such as in automobiles, missiles, airplanes, helicopters, submarines, cathode ray tubes, batteries and even in jewelry and artificial gemstones, etc. It is 45% lighter than steel with comparable strength, and twice as strong as aluminum while being only 60% heavier. Titanium is suggested for use in desalinization plants because of its strong resistance to corrosion from sea water (particularly when coated with platinum). In medical applications titanium pins are used because of their non-reactive nature when contacting bone and flesh. Many surgical instruments, as well as body piercing are made up of titanium for this reason as well. In terms of a mechanism, TiIVbinds well to transferrin in human serum, which could deliver it to the cancer cells. This further emphasizes their future role in cancer chemotherapy and gene delivery. Keeping in view the importance of titanium and environmental issues related to the production of nanopowders, the present work reports an eco-friendly biotechnological approach for the synthesis (lactobacillus assisted) of nano-titanium for possible applications. 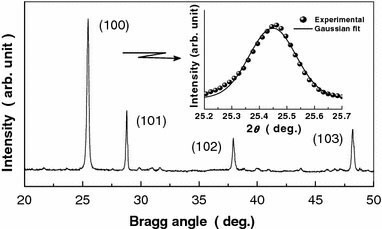 Nanoparticles of Ti were prepared using the procedure adopted by Nair and Pradeep  with slight modifications. The filtrate was diluted 5 times and pH of the culture solution was noted in the range of 2–4 depending upon the strength of the solution. Now 10% suitable sugar solution was added to the culture solution and this was allowed to incubate overnight. Next morning to each of the culture, around 20 ml 0.025(M) titanium dioxide solution was added. 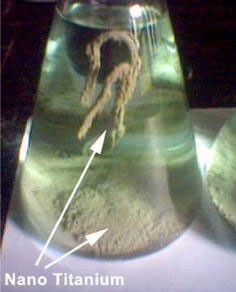 Culture solution now were stirred thoroughly on a magnetic stirrer for 0.5 h and then allowed to incubate in laboratory ambience on a laminar flow. After 3–4 days, the culture solution was observed to have distinctly markable deposits at the bottom of the conical flask (Fig. 1). A remarkable change in pH was observed at this stage, which is currently under standardization. Nanoparticles containing culture solution was filtered under the laminar flow through whatman filter paper, allowed to dry under blow of hot air after which they were used for X-ray and TEM characterizations. The formation of single-phase compound was checked by X-ray diffraction (XRD) technique using a X-ray diffractometer (Phillips PW1710, Holland) with CuKα radiation λ = 1.5405Å over a wide range of Bragg angles (20° ≤ 2θ ≤ 50°). TEM micrograph of Ti was obtained using Philips CM200 transmission electron microscope at 38 K and 200 nm magnification. where β 1/2 = full width at half maximum. The lattice parameters as obtained for Ti particles are a = 4.034(4) Å and c = 6.671(4) Å. The average particle size is estimated to be of the order of 40 nm. The criterion adopted for evaluating the rightness, reliability of the indexing and the structure of titanium was ∑Δd = ∑(d obs −d calc )] found to be a minimum. Inset Fig. 2 illustrates the enlarged version of the (100) peak. A Gaussian model was applied to analyse the curve. where A, w and θ c are respectively the area, width and centre of the curve. The fitting parameters as obtained are I o = 383.61, A = 1210.63, w = 0.1698 and θ c = 25.45. The value of regression coefficient (r 2) was found to be 0.9917. Figure 3 shows the TEM micrograph at 200 nm of the titanium nanoparticles being formed using lactobacillus strain. The micrograph clearly illustrates individual nanoparticles as well as a number of aggregates. The measurement of size was performed along the largest diameter of the particles. The particles are found almost spherical in shape having a size of 40–60 nm. The results presented in this paper are at single pH value and is a part of our systematic work. In conclusion, the present biotechnological method is capable of producing Ti-nanoparticles. Also, it is an eco-friendly low cost approach.